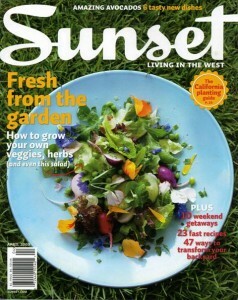 The April 2009 issue of Sunset magazine features my friend Erin Benzakein of floret flowers. Erin is a young organic flower farmer and talented floral designer who values seasonal ingredients for her bouquets and uses sustainable practices to raise a wide array of flowers, blooming shrubs and attractive foliage. I met Erin in the spring of 2006 through her father David Perry, a gifted photographer (that was the first day I met Dave, too, when we teamed up on a garden scouting excursion after being introduced by a mutual colleague). That meeting, at Waverly Jaegel’s antique rose-filled garden in Skagit Valley (Washington State), was the beginning of two inspiring and invigorating friendships for me. The three of us talked about our mutual passion for locally-grown blooms. Erin and I discovered our love of floral design that’s “in the moment,” depending on what’s in bloom in one’s own garden, or what you can find at the farmer’s market, from a friend’s flowering shrubs, or even foraged in the wild. That’s the essence of seasonal and sustainable floral design. 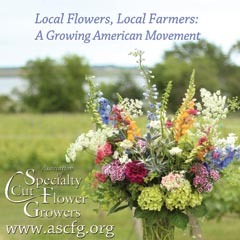 It begins with the farmer who raises those blooms with care for the land and agricultural workers alike. Over time, Erin, David and I realized we all hold a dream of some day creating a book about this topic. We hope it will be filled with stories that I write, photographs that David captures through his lens, and – of course – flowers that Erin grows and arranges. Whether it happens and in what form, time will tell. In the meantime, we are beginning to document the best stories of growers and designers with organic values. 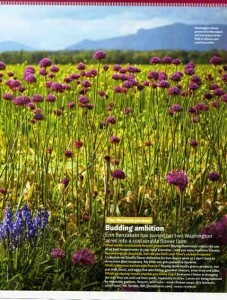 You can see some pretty exciting photographs on A Photographer’s Garden Blog, David’s visually alluring online journal. Inspired, Benzakein planted two rows of sweet peas to create a fragrant “tunnel” (“I wanted to walk down it, just for the experience,” she confides). Suddenly, the 29-year-old mother-of-two became a flower farmer. “It was a done deal. 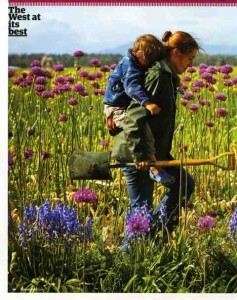 All the vegetables got ripped out and were replaced with flowers.” Since 2007, with her husband Chris Benzakein and their “bunch runners” (9-year-old daughter Elora and 6-year-old son Jasper), Benzakein has operated Floret, a 2-acre certified organic flower farm in Mt. Vernon, about 90 minutes north of Seattle. 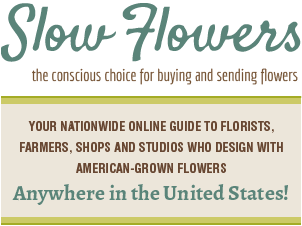 Why are sustainable flowers important? Eighty percent of the cut flowers we buy in the U.S. are imported from countries that do not have worker safety or pesticide regulations. I don’t think we should sacrifice the health of our earth, or that of the farmers, their children and animals, just to have a bunch of pretty blooms on our kitchen tables. If you buy your flowers locally – at a farmer’s market, from a roadside stand, or a grocery store that sources bouquets from local growers – they’re probably sustainably grown. 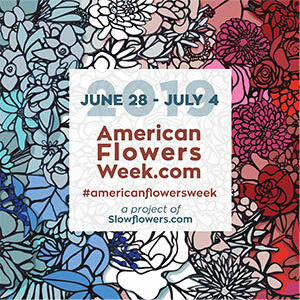 You’ll help eliminate the use of jet fuel that flies flowers to America, keep money in your local economy and enjoy healthier and fresher blooms. What’s the easiest way to bring flowers into your life? Go into the garden you have – right now! Give yourselves permission to cut an awesome bloom or a few sprigs of this or that. You can grab greens from your hedge and pick up local tulips from the farmer’s market. It’s kind of addicting. Yes, I love flowers, but when I give them away, I see how powerful and moving they can be for others. What inspired you to farm sustainably? The most important reason is my children’s health and safety. Our home is in the center of our little farm and my children basically live outdoors during the growing season. Their days are spent among the flowers as they build forts in the raspberry patch, make elaborate doll picnics out of bits from the garden and race up and down the paths while we’re harvesting. I am aware that anything I might use on the flowers, such as herbicides or pesticides or synthetic fertilizers, will be directly in contact with Jasper and Elora. This reality has prompted me to only use organic practices to grow my crops. How do you maximize your two acres to the fullest? My secret weapons in getting the most possible production out of my land: succession planting and feeding the soil regularly. Since I am on a small plot and need every inch, I implement this technique with great success. In the spring, I till in my cover crop, add a nice dose of organic compost, a dressing of organic fertilizer, and plant my flowers. After the first crop is finished blooming and harvested, I pull it out, add another dose of compost, fertilize, and replant with another crop. This enables me to grow up to three times the amount of flowers on my land in a single growing season. 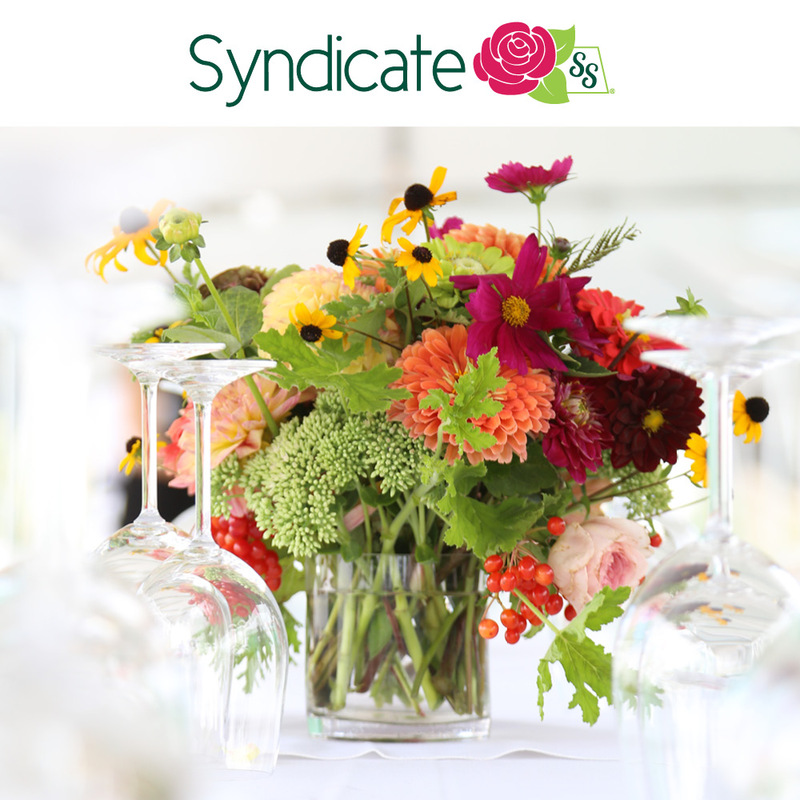 What are some of your favorite flower crops for bouquets and other arrangements? My main crops include sweet peas, ranunculus, peonies, ‘Limelight’ hydrangeas, old garden roses, Oriental lilies, sunflowers, and dahlias. But I harvest from spring to late fall, so there are some months when I cut branches, vines, berries, thistles, grasses and pods for my arrangements. Do you think sustainable gardening is here to stay? People are definitely changing the way they see their yards. Lawns are being replaced by flowers, fruits and vegetables. Whether gardeners are concerned about the quality of their drinking water or the health of their children and grandchildren, they are eliminating chemicals and embracing organic practices. Beyond organic practices, what other ways is your farm sustainable? 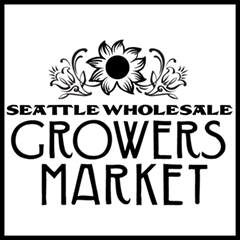 I schedule my Seattle flower and bouquet deliveries on just two days each week so I do not have to drive that 180 mile-round-trip more than necessary. You should see my little van – it’s packed to the brim with flowers! What gardening trends impress you these days? Everyone I know is changing the way they see and use their yards, especially in cities. Lawns are being replaced by vegetable gardens, flowers and fruits. Families are bypassing the synthetic fertilizers and the insecticides they once depended on and learning to compost and garden in harmony with nature. In many urban areas, programs are springing up that educate and support gardeners who want to keep a flock of chickens in their backyards. It’s fantastic! Throughout neighborhoods and along back roads, these thriving little plots are being born and tended to by a band of thoughtful and committed gardeners. What is the next sustainable frontier? I believe buying locally-grown products (flowers, honey, vegetables, milk, meat, eggs – even nursery plants) is the next frontier when it comes to true sustainability. 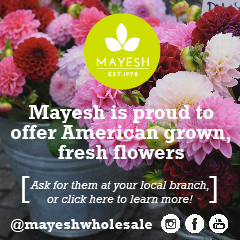 By buying local we are able to support local farmers and artisans. Our money stays in the community in which we live. We reduce the amount of fossil fuel used to transport the goods. 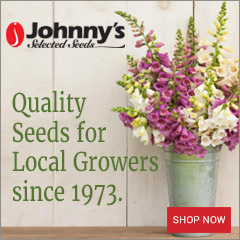 We have access to the freshest, safest, most vibrant – and flowers – on the market. And we are connected to the seasons in the deepest possible way. INFO: Floret (360/424-3403) or www.floretflowers.com. This entry was posted on Saturday, March 21st, 2009 at 10:55 pm	and is filed under Creativity, Gardening, General, Plants, Writing. You can follow any responses to this entry through the RSS 2.0 feed. You can leave a response, or trackback from your own site. Thanks for everything you did to make this possible, Debra. I’m so pleased that you’ve put up the contextual beginnings and the full interview. They round out the understanding of Erin’s business ethos/rationale and reveal just enough of the story of where a couple of passionate, creative types are working to take it from here. Your tunnel of sweet peas experience is inspiring. Just reading your words, triggers the fragrance of sweet peas in my head! I hope I’m not too to get a plant them this year. Oh dear Debra, what a treat to be sniveling in bed yesterday after a nasty ankle-turning fall and come across David’s lovely photo of Erin and Jasper in that ethereal field of flowers in my latest issue of Sunset. I love it that you posted the entire story here – your words give voice to so much more of Erin’s vision and passion on this topic. I’m inspired to hobble outside and pick a posy in your (and Erin’s) honor! Your book is out there…it’s already begun. I have been gardening since I was a little girl and have always wanted to work outdoors and with flowers. The moment I saw the photo of Erin and her son, I cut it out and put it into my garden book. Wow!!! She has totally fueled my desire to start planning for a small organic farm of my own. I will have my now 6 month old son and husband (both love being outdoors and getting dirty) by my side and loving every hard, sweaty, dirty, and rewarding minute of it! !